If the sensor rotor needs to be replaced, replace it together with the rear drive shaft assembly. 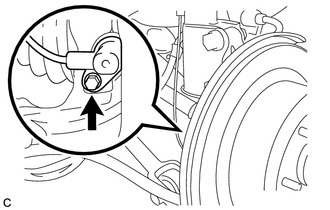 (a) Install the rear speed sensor with the bolt. (b) Install the No. 1 clamp and No. 2 clamp with the 2 bolts. 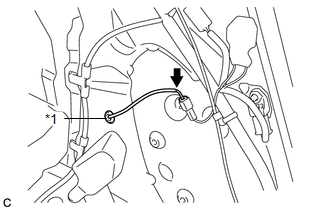 Do not twist the rear speed sensor wire when installing the clamps. (c) Insert the connector and grommet to the inside of the vehicle through the passage hole in the wheel well. Make sure that the grommet's band clamp remains on the outside of the vehicle. 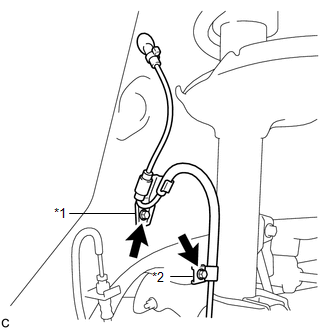 (d) Hold the grommet and pull it from the inside to the outside of the vehicle. Then secure it in place so that it is not tilted. (e) Connect the rear speed sensor connector.